The Aobosi Sous Vide YSV-802 is a mid-level sous vide cooker, it doesn't have any flaws, we just feel it's not as good of a value as the Wancle Sous Vide SVC001. No WiFi, Bluetooth, or Amazon Alexa connectivity. $89.99 Current Price - YOU SAVE 15%. 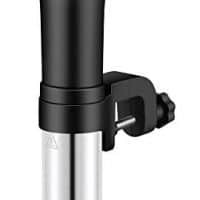 The Aobosi Sous Vide YSV-802 is a mid-level precision cooker, that is a decent quality, but isn't the best value for your money. We don't have any real complaints with this model. We just feel you get a better value with other models. The Aobosi Sous Vide is $89.99 , compared to our second highest rated model the Wancle Sous Vide SVC001 for $87.99 which we feel is a much better value. This model is 16" in height which makes this model taller than the average of all the models we reviewed. it has a standard strength housing and a stainless steel tube housing for the heating unit. It has an adjustable clamp that allows you adjust the position both horizontally and vertically, this is the most flexible configuration you can have. This model puts out 800 watts of power, which is below average for the models we reviewed. It has a flow rate of 1.5 GPM, which is higher than 2.0 GPM average for the models we reviewed. The high flow rate of this model means it will reach it's cooking temperature quicker than the average model we reviewed. There aren't problems with this model, but compared to other models it's not the best choice. For just slightly more money you can get our second highest rated model the Wancle Sous Vide SVC001 which is a much better value. 16" x 3.5" x 3.5" 14.8" x 2.8" x 2.8" 11.1" x 14.8" x 4.5"
The Weston Pro 1100 is commercial quality professional grade vacuum sealer, it's one of the most durable well built models we reviewed, unfortunately it was also one of the most expensive as well.